Employers hire candidates in all three categories, employers often lose candidates over time in all three categories and most of the time the offer will determine the keep time. What do I mean by that? What you are willing to agree to in writing must be clearly identified, as most of the time, both sides will adhere to the terms of the agreement. This is typically true for the duration of what is outlined in the initial offer letter. Why? Because it is spelled out and each party knows what to expect. Both of their signatures on the offer letter solidifies their acceptance to the terms of the agreement. Most people who are willing to take time to spell out the terms, are also the people who will live up to the terms. Once terms are agreed upon, it comes down to performance by the employee to do the job that they were hired to do. If that does not happen, then most likely they are let go, so the agreement is null and void. If the employee asks to modify the agreement and not live up to the terms that they agreed to, this can become an integrity issue. If the employee performs their job, and the employer does not adhere to the terms of the offer letter, then that can also come forth as a credibility issue. Often when not an integrity or credibility issue, the agreement can fail due to either the employee or the hiring manager having agreed to something they did not appropriately plan, personally or professionally, to follow through with. Ultimately, this can destroy the relationship over time. Let’s break down each type of candidate and what some of the typical pitfalls are from both sides. Often the candidate takes the first job they are offered because the number one thing on their mind is a paycheck. In their minds they can’t wait a minute longer, and thoughts of “what if I don’t get other offers” dance in their head. Employers often hire these individuals because they have an immediate need, or they think they can get them less expensively due to them needing a job. Either way, it will fail with time if the person is not the best candidate for the job and either side is settling instead of waiting for the right career match. This is the category of candidate we place as Career Matchmakers. If a candidate can clearly articulate what they are not achieving at their current employer, and also remain at the current employer until the timing is right for both sides for them to depart, they demonstrate forward thinking. These candidates can articulate to the potential new employer what they are seeking, without any discussions of money other than their current compensation package as a baseline. Currently employed candidates are in a position to take the time to interview the new employer while the new employer interviews them. They are providing for their household, and typically still giving 100% to their current employer, while passively seeking their goal of different project types, a relocation, less travel time, room and training to learn something new etc… Typically, in this case, an employer has more time, more information and the ability to process and spell out expectations. Too often employers may go after a currently employed candidate with a big money carrot, only to find that even if they convince them to grab the carrot without clear expectations, other than money, they will soon depart. This type of candidate is well balanced, and if both sides don’t take time to effectively do an interview process, and the job doesn’t play out as expected, these candidates will leave regardless of how much they are paid. This group of individuals always thinks they are worth more, should be paid more and define career growth in dollars. Most of them are not coachable and trainable or if they were, they would ask poignant questions and not start off with “How much are you paying?” Sometimes you may need one of these individuals due to a need or a special skill they bring to the table for a particular project. Employers beware. They will need motivation by money, and if they don’t get it, as soon as someone else hangs the next carrot they are gone. These were the candidates that were let go first during the recession, but due to supply and demand are at it again. They have “the bird in a hand is worth two in the bush mentality”, instead of how can they help the company be profitable and sustainable, allowing the opportunity for financial growth, while having a stable career and maintaining relationships. Hiring from all three categories might be appropriate at given times. Keeping any candidate comes with eliminating false expectations, and both sides understanding and following through with what is discussed with actions. A thorough interview process and a detailed offer letter is a great start. We have provided a sample below. The article on “Interviewing is all about you” discusses the process. 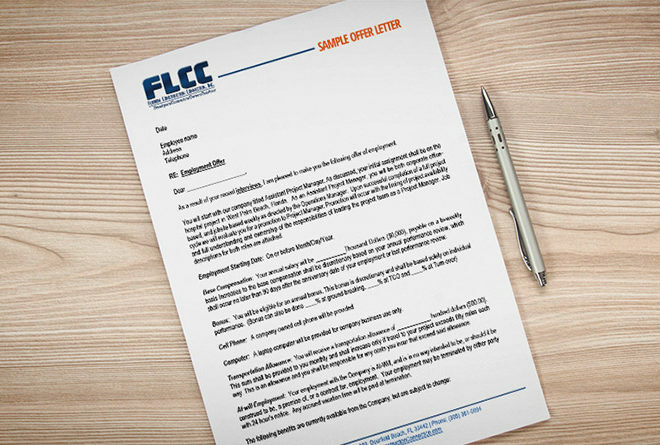 Demonstrate Your Professionalism with a Formal Offer Letter! Taking time to present an offer letter to a new hire not only demonstrates the integrity of a company willing to put terms in writing. It also provides a document for all to refer back to if there is ambiguity down the road with what was discussed or so called promised on interview. “A picture is worth a thousand words.